I’ve always been fascinated by Atlantis, I mean who wouldn’t be. A lost paradisial civilization, perfectly intertwined with nature, possessing free energy, superior technology, and interstellar travel. Albeit most of what I just said is not from Plato’s dialogues Timaeus and Critias that reference Solon who translated Egyptian records of Atlantis when he visited Egypt between 590 and 580 BC. Most of my beliefs about Atlantis originate from modern psychics and hypnotherapists such as Dolores Cannon, Edgar Cayce, and Taryn Crimi. For years I’ve studied Atlantis, I’ve read all of the Greco-Roman historians who mention Atlantis or Atlanteans, but for the life of me, I didn’t see what was right in front of me the whole time. Herodotus told us in his writings exactly where Atlantis really was. But unfortunately, people like myself tend to see what we’re told to believe by way of movies and books, instead of objectively interpreting the data ourselves. But once we have unlearned what we have learned, we will discover all we desire to know. Herodotus in his Histories places Atlantis in northwest Africa, in the now deserts of Mauritania. There are many reconstructed maps of Herodotus’s geography showing that in Herodotus’s time, they knew exactly where Atlantis was. What’s even more incredible is there’s a structure called the Eye of the Sahara, or the Richat in Mauritania. This structure fits the location, dimensions, and structure of Atlantis exactly as described by Plato. For those who don’t know, according to legend Atlantis was founded by Atlas the son of Poseidon and the mortal woman named Cleito. But what’s really interesting is according to Mauri legend, an ancient people the country of Mauritania is named after, Atlas was a legendary king of Mauretania credited with the invention of the celestial globe. 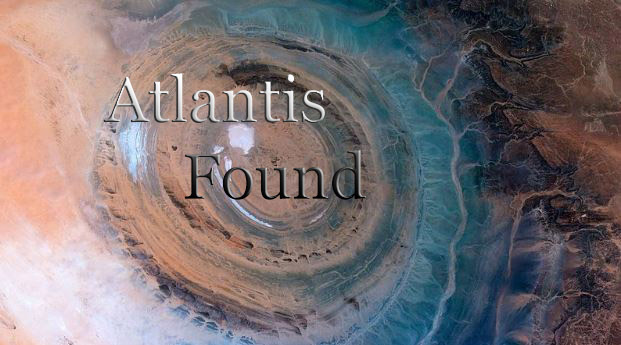 When I discovered this incredible information I searched the internet and youtube to see if anyone else had discovered the true location of Atlantis. There was one video where this dude referencing Herodotuses writings was exposing the true location of Atlantis in North West Africa, but I can no longer find it. But now there are quite a few videos on youtube proving that the elusive location of Atlantis is in Africa. This one particular video is very informative, click here for video. Pondering all this incredible information, it made me re-think what Edgar Cayce said in regards to the lost records of Atlantis in the Yucatan. According to Cayce, Atlantean refugees escaped to the Yucatan and hid their records of Atlantis in these new lands. But every video I’ve seen, and every book or article I’ve read in regards to the lost records, always reference the Mayan culture and hidden tablets or writings in one of their many temples or pyramids. I always wondered why none of these movies, books or articles in regards to the lost records ever referenced the first Meso-American pyramid builders, The Olmecs. Olmec civilization was also based in and around the Yucatan. The Olmecs really piqued my interest, so I started googling random phrases and keywords linking Atlantis and the Olmecs, and I found on Google books one of the most interesting books I’ve ever encountered, “Spiritual Archaeology” by Ronald Ritter & Sussan Evermore. Ronald Ritter and Sussan Evermore were not just psychics but also necromancers, meaning they communicated with the dead. Chapter Five: The Prophecy of 2012, The answers, what will happen, hear the message from an Olmec entity. When I saw the first and fourth chapters, I knew I had to get this book. I searched the internet for the book, but it no longer existed. I couldn’t believe it, it was nowhere to be found. I even searched its ISBN number on Amazon, Barnes & Nobles, and ISBNsearch.org… nothing. This was odd because Amazon had every other book Ronald Ritter and Sussan Evermore published. I even went to the publisher’s website and searched the ISBN, but it came up with no title reference. I’ve never encountered anything like this, it’s like someone or some group erased it out of existence. But I didn’t give up, I kept searching, and that’s when I found a European website that indeed had the book, but they only allowed me to rent it by reading it online. When I finally got my eyes on it, what I read was mind-boggling, the 4th chapter really intrigued me. In chapter four it states that In 2011 while Ronald and Sussan were in Mexico, they were guided by the spirit or Osiris to go to La Venta Park where the famous Olmec heads were located to find the answers regarding 2012. When they arrived they felt an immediate connection with the Olmec heads and the symbols of “Mu and Atlantis”. Sussan was standing beside a sculpted Olmec stone priest when she began to feel a strong presence. She then channeled the entity who identified himself as the priest that was sculpted in stone and directed her to ask him the questions she had come to ask. She asks the Olmec what will happen in 2012, and unlike all of the doom and gloom prophecies we’ve all heard, the Olmec replied with something totally different, he said, “you will all be released”. The Olmec further states that the change everyone is referring to is not eminent destruction but the return of the creator God energy of Bolon Yokte K’uh to the earth, and humanity will be given an opportunity to rejoin “us”. He says that there will be a shift in consciousness in those who want to connect. What really interested me is when he said that people will not feel the shift, but will later understand, and will go to sleep and wake up in another reality and that there will be a splitting of the earth according to consciousness. Ron asked, ” how will we feel this energy”, and the Olmec replied ” with the creator god energy of Bolon Yokte’ku you will feel lighter and become more attuned, and that people would feel the energy as a vibration in the hands and body. This is really interesting because Dolores Cannon through hypnosis and Penney Peirce with her intuitive ability have talked about the splitting of the earth in a similar way. The Olmec further says humanity has to make a choice, continue on a path of destruction or exist in a parallel world that was created by the “council of entities”. He states that humanity is comatose, that we have existed in ignorance of our true origins for thousands of years, and that we have been strategically distracted by “others” misuse of power. He then states that the next step in human evolution is to understand that we are gods in our own right, capable of creating our own reality as we desire. Ron then asks the Olmec of his origins and the Olmec stated that he and the other Olmec are of Atlantean and Lumerian origin and that they had escaped the destruction of Atlantis, and had returned to Mexico as volunteers to rebuild another paradise. Pondering the information in this book, I don’t think the lost records of Atlantis are recorded on tablets or scrolls. Evidenced by this encounter with the Olmec, the lost Atlantean records are probably in the Olmec heads, held there by a remnant of the spirit energy of the Olmecs themselves. You can purchase and download this e-book “Spiritual Archaeology” by clicking here.